The Pennington-McIntyre Gallery was named by retired CCC instructor/administrator Dr. Dorothy Pennington McIntyre. Dottie also named the foyer entrance (by the security desk) in the Jack Hunt Campus Center. Want to exhibit with the Pennington-McIntyre Gallery? Apply Here! Submit your application online or Download the printable version. If you have any questions, please feel free to contact the gallery at 704-484-4054. 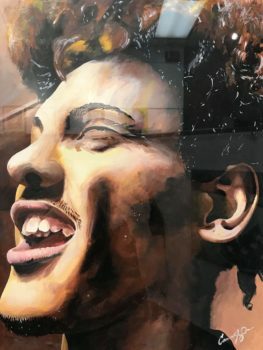 “Portraits” features artwork by artists: Mariah Cline, Cameron Hagler, Blake Lee Ferguson, Elizabeth Albright, Jennifer Pearson, Becky Sain, Rocky Smith, Roger Perry, Lisa Rodriguez, Treven Persing and more! Cory, a painting by artist Cameron Hagler. “4 Series” featuring artwork from the series Bees and Death, Houses that Made Me, The Four Genres, and Value Studies in Powdered Graphite by artist, Casey Quinn. 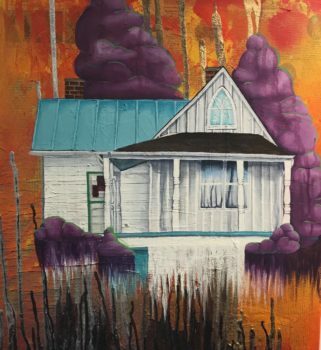 Dipple House by artist Casey Quinn.